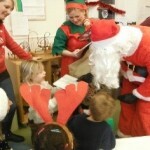 On Saturday morning Santa visited Preschool for Breakfast. The children had an amazing morning speaking to Santa and getting one of their first gifts this year. This event along with other recent fundraising events has raised over £1000 for the Preschool which will be put towards new resources for the Preschool. We would like to say a BIG thank you to all those who came along and supported the event and to all the local businesses who supported us by donating raffle prizes.